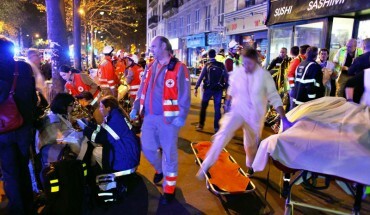 The terrorist group ISIS (also known as the Islamic State) has claimed responsibility for a night of terror in Paris that left at least 127 dead and 300 injured. In an official statement, the group said its fighters strapped with suicide bombing belts and carrying machine guns carried out the attacks in various locations in the heart of the capital which were carefully studied. … Having dared insult our Prophet, having bragged about fighting Islam in France and striking Muslims in the Caliphate with their planes which have not helped them in any way in the ill-smelling streets of Paris. This attack is just the start of a storm and a warning for those who wish to draw lessons. ISIS has also released an undated video threatening France and urging Muslims who can’t travel to Syria, where the terrorist group holds territory, to continue attacks in Paris. France was already on high alert since the attacks at the satirical newspaper Charlie Hebdo and a kosher supermarket in Paris in January 2015. Those attacks, carried out by Al Qaeda’s affiliate in Yemen, killed 18 people. The magazine became a prime terrorist target because of its controversial drawings of the Prophet Muhammad, depictions of whom Islam strictly prohibits. Shortly after the Friday evening attack, French President Francois Hollande took an unprecedented step in closing the country’s borders. He has already blamed ISIS for the attack and described it as an “act of war.” He plans to address parliament on Monday in an extraordinary meeting. The attackers used guns and bombs at several sites across Paris on Friday, including the Stade de France stadium and the Bataclan Theater, where a hostage situation saw more than 100 killed. Eight attackers have died — seven after killing themselves using explosive vests, according to Reuters — and the authorities are now searching for accomplices. France will also observe three days of official mourning. Previously, ISIS also claimed responsibility for downing a Russian passenger plane that crashed over Egypt in October. After that supposed attack, which investigators have not released an official conclusion on, ISIS also released a video threatening to attack Russia more directly. ISIS’s claim of responsibility could drag western countries even deeper into conflict in the Middle East, which would be a win for ISIS. The group has a doomsday ideology and believes that Islamic fighters will battle the “infidels” of the West in Dabiq, a town in Syria that ISIS now controls, at the onset of the apocalypse. Reuters reporting contributed to this post.